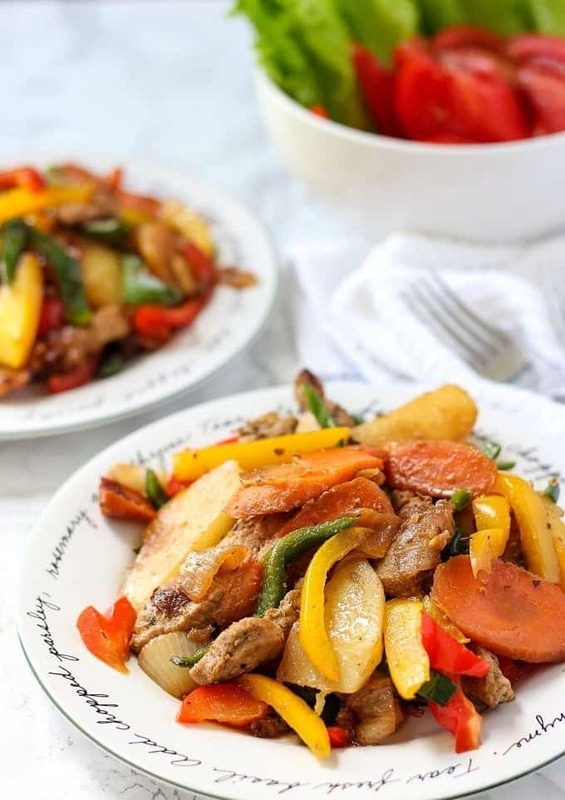 Easy to prepare One Pot Pork Vegetable Stew is a delicious and comforting weeknight meal your family will enjoy. Who likes to cook after long day of work? Me…not. Definitely not. I remember the time when I had 9 till 6 full time job. After long and exhausting work day, I would go back home at 7 pm and cooking would be the last thing on my mind. I would sure want to eat though, but the idea of spending a precious hour prepping meal was not very exciting to me. That’s why I never made complicated recipes or even the recipes that had multiple ingredients. Many times I would make bulgur porridge with an egg for dinner. Sounds fancy, right? :)) At that time I didn’t know many recipes and I didn’t bother to search for them. Everything changed when I became a mom. As any other mom, I want my children to eat good. But there are days when the time is not on my side, yet the dinner has to be prepared. That’s why I love this Ukrainian style One Pot Pork Vegetable Stew. It’s vibrant, delicious and can be thrown together in 30 minutes or so. Also, everything can be prepared in one pot. It’s a perfect tasty and nutritious meal for busy weeknights. Pork tenderloin works best for this dish, it has a little bit of fat, so the meat always comes out juicy. This One Pot Pork Vegetable Stew is a typical Ukrainian dish and every homemaker knows how to do it. In Ukraine, we typically don’t use a lot of vegetables in this stew, but I love how colorful it came out with bell peppers and carrots. I get hungry even by looking at the pictures. In a medium bowl, combine tenderloin, dried oregano, soy sauce and Jalapeño. Let everything marinate for 20 minutes. Heat oil in the large non-stick pan and on the medium heat. Add minced onion and cook until translucent, about 5-7 minutes. Add tenderloin and Jalapeño mixture and continue cooking for 10 minutes. Add carrots and cook for another 5 minutes. Add potato, chicken stock, cover the lid and cook for 10 -15 min minutes, stirring occasionally until potato is cooked through. Add salt and pepper to a taste. Add butter, red, yellow and green bell peppers, garlic and cook for 5-10 minutes, until peppers are soft stirring the stew from time to time. What a delicious looking recipe. I don’t eat pork enough, but I love it. 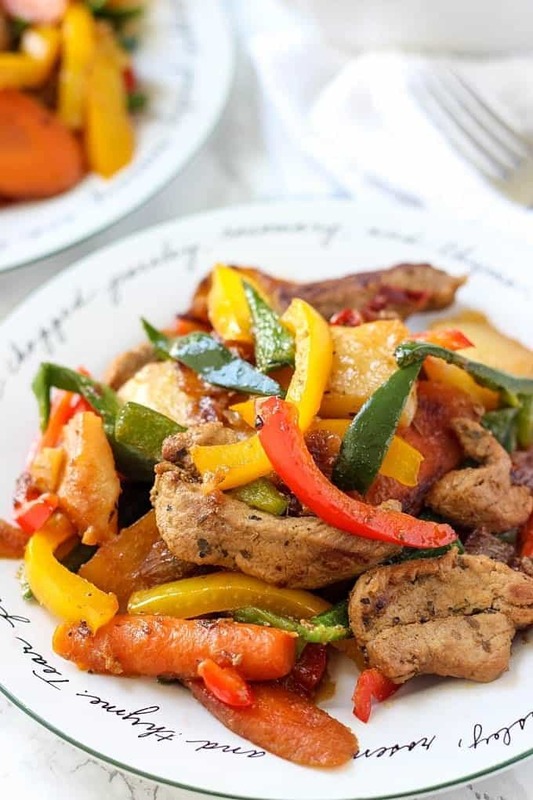 This recipe looks delicious and full of flavor! Thanks for sharing.